(CNSNews.com) - An Internal Revenue Service employee used a federal government charge card to purchase an Amazon Prime membership, according to a report released by the Treasury Inspector General for Tax Administration (TIGTA). There are 2,562 IRS employees who have government charge cards, according to TIGTA, and in the six-month period from Oct. 1, 2017 to March 31, 2018, they used those cards to make 16,980 purchases, spending $6.12 million in taxpayer dollars. The IRS, which is required to issue a report every six months listing “employee purchase card violations,” did not list the employee’s purchase of the Amazon Prime membership during the period in question (Oct. 1, 2017 to March 31, 2018). 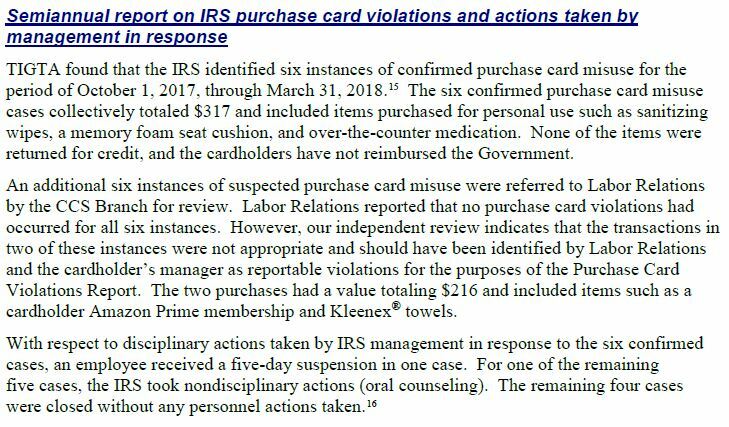 “TIGTA found that the IRS identified six instance of confirmed purchase card misuse for the period of October 1, 2017, through March 31, 2018. The six confirmed purchase card misuse cases collectively totaled $317 and included items purchased for personal use such as sanitizing wipes, a memory foam seat cushion, and over-the-counter medication. None of the items were returned for credit, and the cardholders have not reimbursed the Government. “An additional six instances of suspected purchase card misuse were referred to Labor Relations by the CCS [Credit Card Services] Branch for review. Labor Relations reported that no purchase card violations had occurred for all six cases. However, our independent review indicates that the transactions in two of these instance were not appropriate and should have been identified by Labor Relations and the cardholder’s manager as reportable violations for the purposes of the Purchase Card Violations Report. The two purchases had a value of $216 and included items such as a cardholder Amazon Prime membership and Kleenex towels.